Top 7 Week of the American Idol Season 11 was very tough. All contestants have shown an amazing performance in both individual and group/pair. If I were to judge, it's really difficult for me to rank them. Not only did all of them showcase their vocal prowess to the highest degree, but their choice of songs was unbelievably beautiful! I'm just in awe watching all of their performances with a big grin on my face and my heart bursting with so much joy. I'm giving all 7 contestants a rating of 5/5 equally. Some were obvious that really stood out from the rest. But I give credit also on the kind of songs they chose based on their liking and vocal quality, and how they gave justice to the songs. Some individual performances were not that powerful in terms of technicalities/ movements on stage, but you could see how they moved you with their voice. That's how I felt watching them. The kind of songs I would love to listen to (or sing) plays a big part in my ranking them this way. In other words, my rank here is this: Voice + Talent + Performance + Impact + Song Choice + (anything/everything). This is my personal judgment. I'm not in any way swayed by the comments the judges have made. These are my own personal choices. This is me. 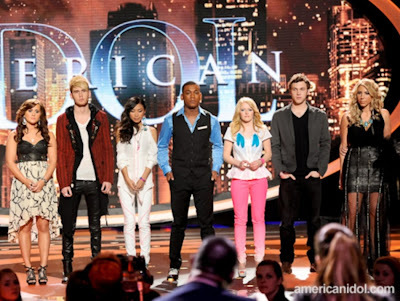 Voted off this week was supposed to be Jessica Sanchez for getting the lowest number of votes. But the judges have saved her from elimination. Should I be happy? Oh yes, I'm ecstatic! I'm extremely happy!